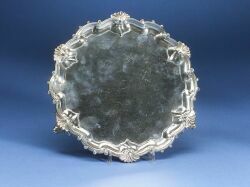 Edward VII Silver Salver, London, 1903, Edward Barnard & Sons, Ltd., makers, round, with molded scroll and shell rim, raised on three flat leaf and scroll feet, dia. 8 1/4 in., approx. 14 troy oz.